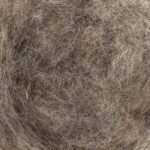 The following pictures are Bergschaf Wool. This wool comes from Austria. This is the ideal wool to make slippers and products that are more robust because this is a 30 micron wool. It is a good filler and it is excellent for wet felting. It is also perfect for 3 D projects that need strength.  This wool is ideal to make boots, bags, vessels, and foundation for all sculptures. It is a short fiber and very warm. It can be combined with maori wool on a surface design. You can add vegetable fibres like hemp, linen, rami and cotton to decorate the surface. It is great to make bird houses to hang outside. If you use this as a filler it will not spring out or bounce when you needle felt with it. It comes in batts and is sold in 250 grams, 500 grams and 1 kilo sizes. These fibers are not dyed this is the natural color that can be found on the animal. 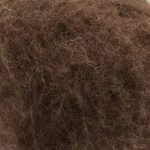 It is a carded wool. Cette laine est idéale pour fabriquer des bottes, sacs, contenants et la fondation d’une sculpture 3D. Cette fibre provient de l’Autriche. Elle est 30 micron.